What do you get when you combine a silver screen spa experience, a DIY beauty treat, your favorite blankie & pj’s, champagne & popcorn (and maybe a family member or two – your choice)? Spa Flick Friday! At the end of a week I’m often just too tired to go to the theatre, cuddling up on the sofa is way more inviting. Plus, due to the rising popularity of spa, many movies feature or reference spa & even if they don’t some are just as relaxing and make me feel as happy as a few hours on the massage table. 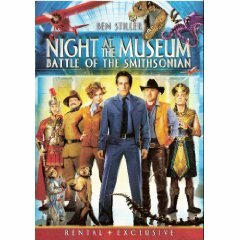 For example, I watched <a href=”Night at the Museum: Battle of the Smithsonian “> two nights ago when I was brainstorming. Not your typical chick flick, the setting of the Smithsonian is one of my fave museum retreats. (How fun would it be to run through the halls of that place at night?) And, low and behold even in a fun flick like this, there it was, a spa reference. Can you find it? Comment below & let me know if you see it. Hint: Owen Wilson (as Jebediah), an hourglass and sand are involved and he chides his capturer that this is not torture, but a spa treatment. And scrub away as you screen our Spa Flick pick of the week.